Is it time to take the chance to choose to change? When it comes to the historic debate over which is the most powerful computing technology around you can forget Apple & it’s Mac or Microsoft & it’s Windows and look a lot closer to home. Just take a look in the mirror because every single one of us comes complete with the world’s most powerful, pre-loaded, fully operational software system there ever has and most probably ever will be…our brain! In simple terms the brain itself that 3lb or so mass of grey/white tripe like matter in our head acts like a modem ensuring that our hearts beat on average 100,000 times per day thus keeping us alive and by definition functioning. As amazing as this feat is in and of itself, it’s largely acknowledged that the active part of the brain, the part which processes & regulates the electrical energy which becomes information is…the mind. Without becoming embroiled in science, the mind itself is subdivided into 3 parts; conscious (awareness of the present), subconscious (awareness of accessible information) & unconscious (memories & experiences which form belief & behaviour patterns)….it’s bombarded every single second that you are alive..and yes that includes while you’re sleeping…by millions of bits of information all of which are processed instantaneously & subconsciously. Although on the one hand that’s amazingly good news when you think about it…we don’t have to remember to breath, remind our hearts to beat, blink the grit out of our eyes & so on…the time management savings on this fact alone are immeasurable. On the other hand however given we’ve already established that we technically operate by remote control it’s where many of us come unstuck. The unconscious element of our mind, the part where our memories & experiences have been safely stored away and added to time and again over the years has been quietly laying the rock solid foundations upon which our behaviours & beliefs have been formed. Those same beliefs & behaviours which impact all day, every day on the way we live our lives. The ones which determine our mindset…the way we act & react to life. The ones which predispose us to positive or negative behaviour. In short the ones which colour not only our view of the world but that of ourselves and our perception of what we can or cannot achieve! For many of us this isn’t an issue, for others however it’s these unconsciously formed belief systems which can and do form the basis of all manner of psychological issues from lack of confidence & low self esteem upwards. The trap that we sometimes fall into (often willingly because it’s the easiest option) is that just because it’s always been this way that’s just the way it is or worse still has to be. Errr…Wrong. Wrong oh and err WRONG! Everything in life is temporary…the seasons, the situations we find ourselves in, our lifespan and very definitely our thoughts. Is that true? Of course not because times have changed, cooking appliances have evolved, new recipes and innovative chef’s like Mr Oliver have made sure that we can IF we choose cook beef differently. Our thoughts and by association our mindset are absolutely no exception to this. Of course as children we are very much guided by our responsible adults but as we learn and grow there comes a natural point at which we become responsible for our own lives, our choices and the way in which we want them to play out. If you really don’t like something your career, your relationships, your work/life balance or anything else for that matter but you are paralyzed by the inaction borne on the back of… I can’t do anything about this because…(you fill in the blanks) then I’m here to tell you that you most certainly can and whatever it is you wish to change although it may not be easy, in this day and age it is more than definitely possible. If you want to live the reality of your dreams, write a book even become a brain surgeon when everyone in your family has historically been a shopkeeper (incidentally there is nothing wrong with shop keeping) or anything else in between then you and you alone have the capacity and the choices available to you to make it happen! 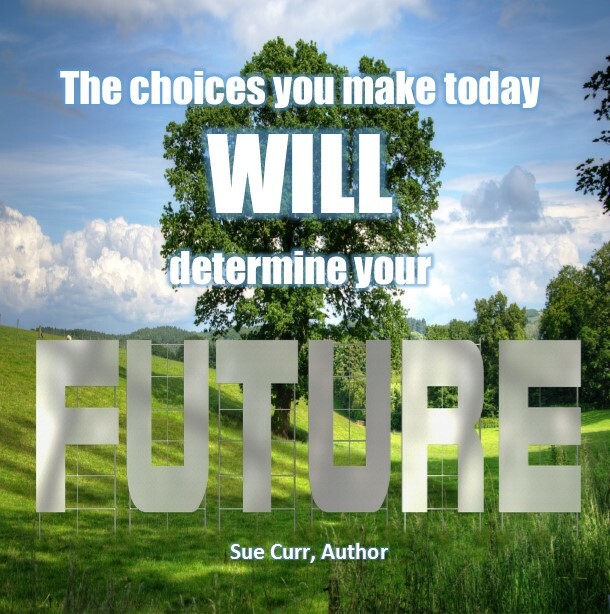 When you realise this then you have to CONSCIOUSLY as opposed to unconsciously make the choice to choose to change the way things are and most certainly have to decide how you’re going to execute that. Start small, having thought about what you REALLY want to change especially if it involves one of lifes’ important intangibles write it down and as you do so say the words out loud. When we see things laid bare as we write and at the same time enhance that by verbalising them we reinforce the signals we are sending to our unconscious mind…our beliefs and behaviour bank if you will…that things are about to change. Do this often, several times daily preferably it’s a massive step in the reprogramming of your thought process. Obviously as important a start as this is, in and of itself it isn’t going to create the long and lasting change which you seek. You have to be willing to build on the foundation by becoming self aware. Aware of your negative self-talk When you catch yourself thinking or saying anything which has a negative or dis empowering effect on you stop and ask yourself how you can rephrase the thought to change it’s meaning to it’s positive opposite (it’s a simple law of physics that for every reaction there is an equal and opposite reaction and the thought process is no different). The chances of successfully achieving the change you seek (regardless of the area) will be further improved by taking steps to remove yourself from negative or toxic situations and relationships and importantly by YOU being honest with yourself, brutally honest about not only what you want but what you will need to do to ensure it happens. Which by the way should always include surrounding yourself with like minded people. You need to take your goals – plan them out and then take action. 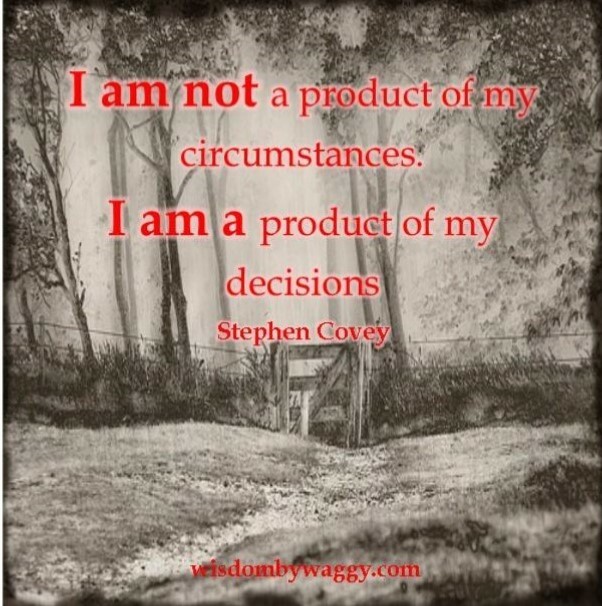 As with every major decision you will ever make it all starts with you. It has to. The responsibility for living the life you want to live is yours and yours alone. YES take advice and guidance from people you trust and/or outside agencies but always remember knowledge doesn’t become learning until we make the leap from what we do know to what we don’t! Be awesome in creating your new life by design instead of living it by default. 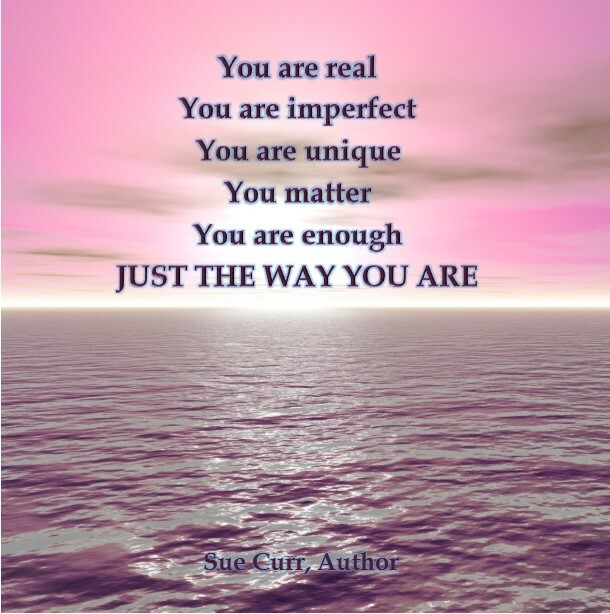 This entry was posted in Blog Posts, Gratitude, Mental Health, Self-Esteem and tagged choose to change, coaching, empowering women, empowerment, fearless, mental health awareness, mindset, motivation, personal development, responsibility, self care, self confidence, Sue Curr Speaker Author on January 27, 2016 by Sue Curr | Fear Less - Live More. There isn’t anything. Not one single thing you cannot achieve having decided that you want to. Once that is you’ve given yourself permission to do so! You are the author & the architect of your life. The life you dream about, the one you want, the one you deserve. 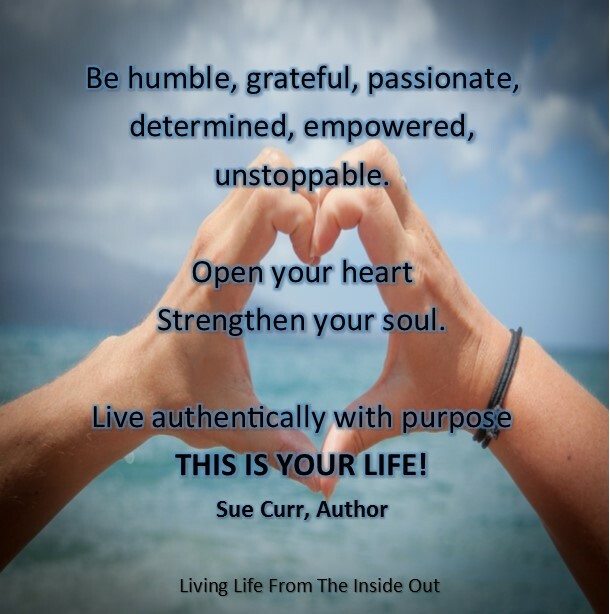 If you’re not happy with your lot, feel as though life is passing you by or are maybe paralyzed by inaction brought about by the fear of what others think about you then it really is time to start living your life, in your own way & on your own terms. It’s time to start living by design and stop living by default as a result of operating on autopilot & simply just letting it happen to you. I say again there isn’t anything that’s impossible for you to achieve when you set your mind to it but you have to start by believing that you can. No matter how wild or improbable your dreams are. The bigger the dream, the bigger the plans you need to make for sure but in doing so the more you will succeed. Be happy & celebrate how far you’ve come already but remember you can always go further if you choose because life in itself really doesn’t have any limits except those you impose upon it and therefore by default yourself. If our old friend fear should raise it’s head as it surely will when you’re faced with stepping outside your comfort zone learn to trust your instincts but more importantly yourself and ask what’s the worst that could happen if I take this leap of faith? In all honesty it would be that you remain exactly where you are now except for learning what doesn’t work in your quest to get to where you want to be and in my book that’s a massive plus because it’s one less thing to worry about. Even if you aren’t successful in your aspirations initially bear in mind that if you keep coming back to the same starting point then it’s more than likely that you’re on the right track and you just need to figure out which turning to take to reach your destination. Take the opportunity in fact any and every opportunity to learn what works for you regardless of whenever and however it arises after all a day without learning is a waste of a day. Remember that it doesn’t matter how you get to where you want to be, only that you do. Over, under, around, through, slowly, quickly? It really doesn’t matter, don’t focus on the how to but on the are doing scenarios. Our dreams and goals remain exactly that until such a time as our thoughts are surpassed by consistent, determined and positive action because as sure as the sun will rise tomorrow if you do’t go after what you want you will never get it no matter how much you dream. Whatever you do, don’t fall into the trap of assuming that if you simply want something enough it will happen. Far from it. You have to do the groundwork and lay the solid foundations upon which to build your dreams and goals. 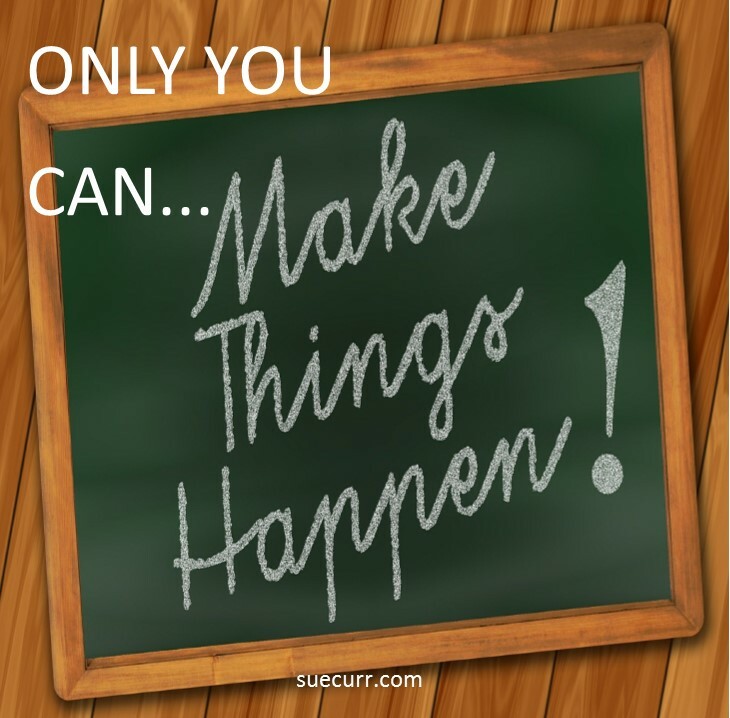 In short you have to…go out and make things happen. For instance you may dream about winning the lottery but you definitely won’t win it if you don’t buy a ticket. You have to be in it to win it…right? Likewise when you get into your car if you simply turn the ignition & then sit back and wait for it complete the journey from A to B without you doing anything further will it happen? Of course not and life…your life is exactly the same! 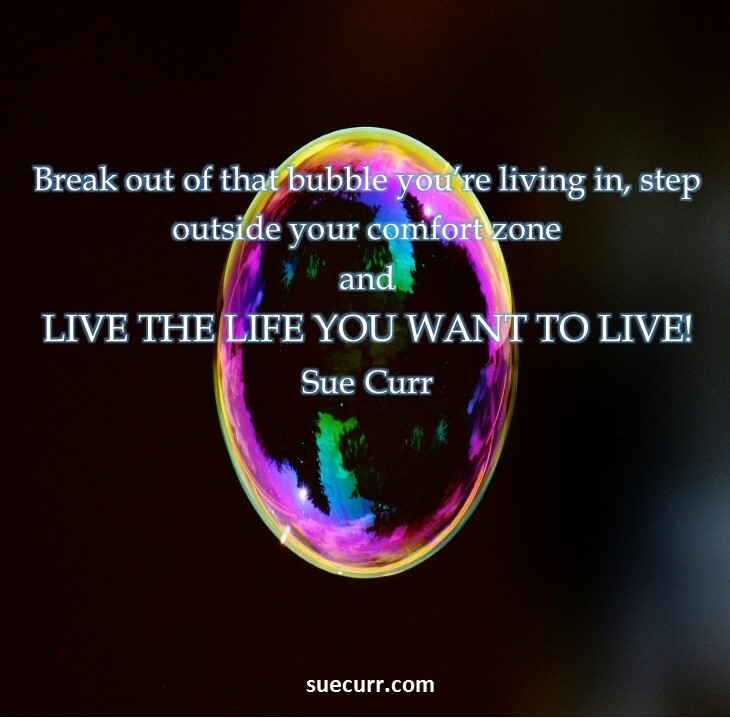 This entry was posted in Blog Posts and tagged author, choose to change, comfort zone, comfortable in my own skin, determination, empowering women, empowerment, mental health awareness, motivation, motivational speaker, personal development, self belief, sue curr on January 17, 2016 by Sue Curr | Fear Less - Live More.